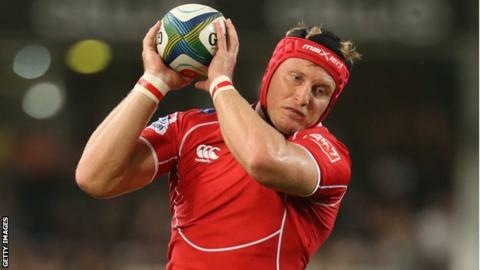 South African lock Franco van der Merwe is joining Ulster next season on a two-year contract. He will be a direct replacement for his countryman, Ulster captain Johann Muller, who is retiring at the end of the season. Van der Merwe, 31, has spent the last eight seasons playing for the Lions team in the Super Rugby competition. The second row forward won his only cap in South Africa's Rugby Championship match against New Zealand last year. He will join Ulster in the summer after the Super Rugby season ends. Van der Merwe is currently sidelined with an ankle injury although he said he hoped to be back before the end of the Super Rugby campaign. He had a loan stint with the Sharks last season before returning to Johannesburg with the Lions. Van der Merwe said: "I spoke with Johann Muller and Ruan Pienaar about Ulster and they had only good things to say. That made the decision really easy for me." Meanwhile, Ulster's loose-head prop Paddy McAllister has signed for Aurillac, the French Division Two club managed by former Ireland forward Jeremy Davidson. McAllister missed the entire 2013-14 campaign after sustaining a cruciate ligament injury in pre-season training.